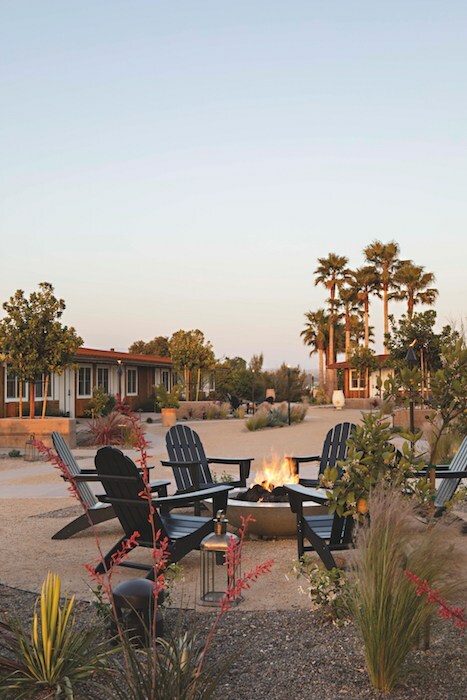 remodeled into a gathering spot featuring fire pits and native gardens. Photo courtesy Skyview Los Alamos. 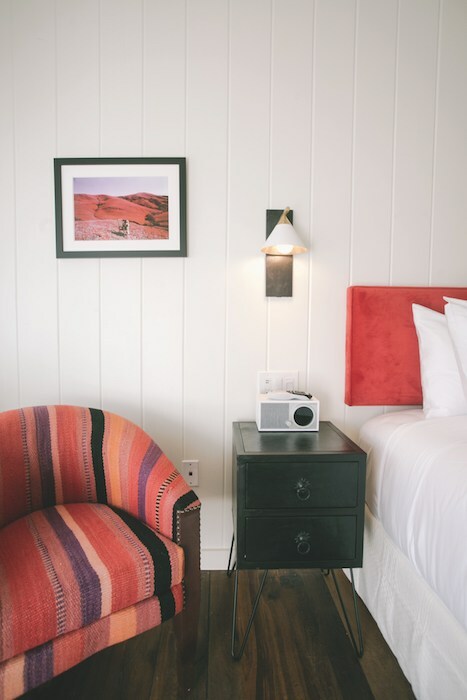 On the hilltop overlooking the quaint western town of Los Alamos sits a midcentury modern gem of a new hotel—the Skyview Los Alamos. 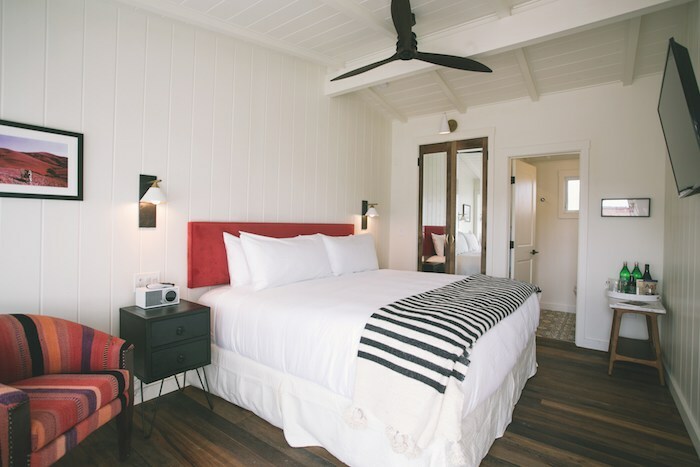 This boutique, 33-room property—including two spacious suites and 16 deluxe rooms with private decks with outdoor showers and fire pits—opened last spring, somehow managing to maintain the historic 1950’s motel vibe, while infusing it with equal helpings of modern conveniences and hipster coolness. 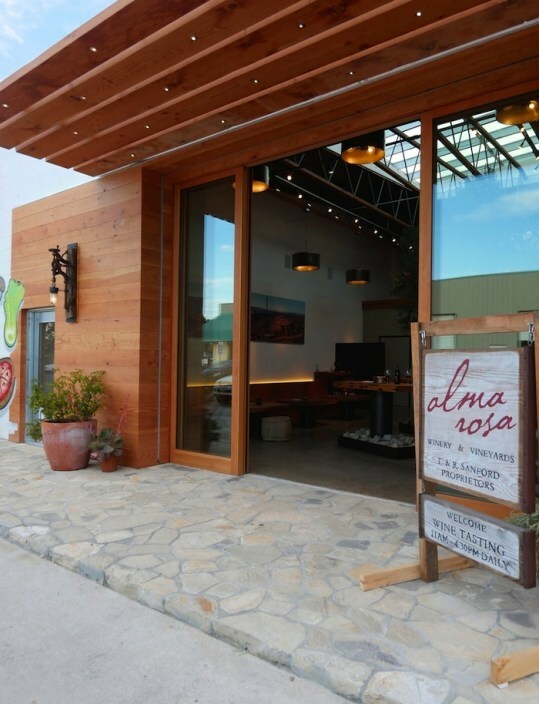 “We were inspired by the western roots of Los Alamos, the midcentury architecture of the motel, and our love of travel,” explains Kimberly Walker, managing partner and co-owner of Skyview Los Alamos. The Midcentury golden starbust door welcomes visitors to Norman, the excellent onsite restaurant. Photo courtesy Skyview Los Alamos. Like many others (myself included), Walker had driven past the motel for years and wondered what it was. “We always saw the motel sign going, ‘oh, what is that on the hill?’ But we fell in love with Los Alamos, the food, the wine and the people. When the motel went up for sale, we moved on it quickly. 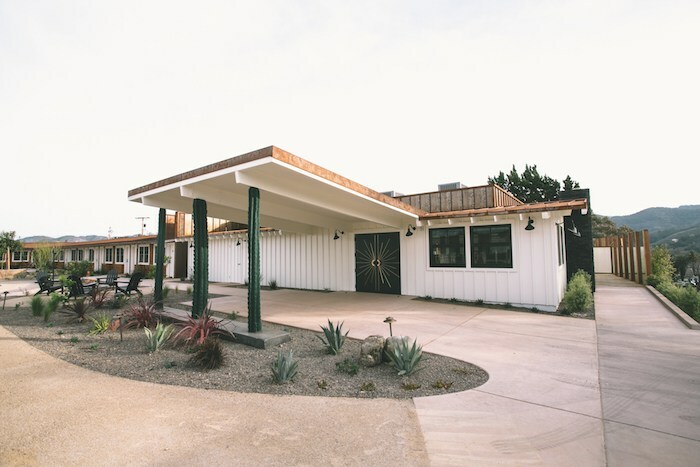 We purchased the property in 2016 and spent two years renovating the motel, sprucing up the grounds, updating the design and restoring its midcentury architecture. We also turned the former asphalt car park into communal native gardens with fire pits to create space for guests to relax and gather,” she explains. The attention to detail is incredible. 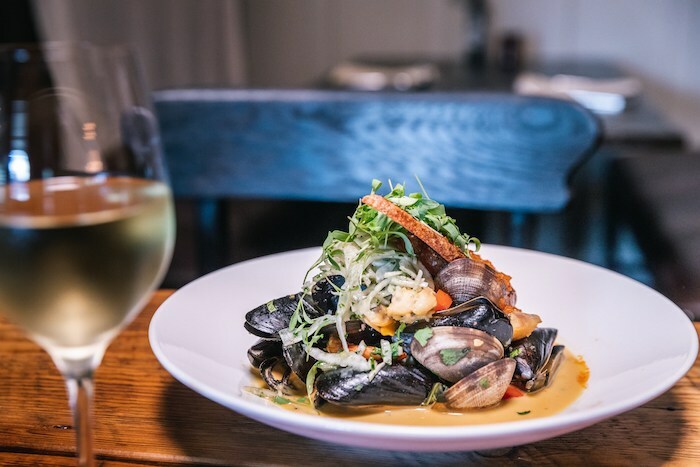 Guests are greeted with a cup of locally sourced Dart Coffee or a glass of local wine (and soon the 2.5-acre onsite Skyview Vineyards will yield their own Pinot Noir, overseen by winemaker Mikey Guigni of Scar of the Sea Wines). Each room’s carefully crafted decor reflects both the location’s western heritage and modern luxury elements. Photo courtesy Skyview Los Alamos. Each room is its own bespoke design, with thoughtfully sourced and unique décor, including flat panel televisions, down duvets, leather club chairs and marble-clad bathrooms with hand-painted tiles and farm sinks, as well as luxury amenities such as locally made Fable Soap products in the bathroom and Abba-Zabba candy, Good Zebra munchies and Casamigos Tequila in the mini-bar. 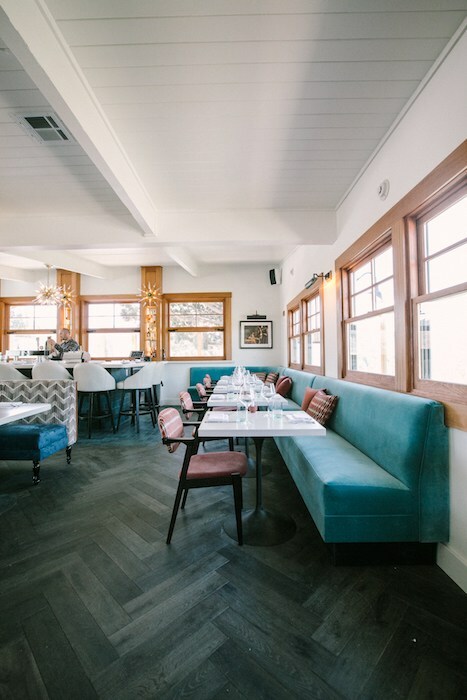 Another peek at the room’s interior, with elements of both the location’s western heritage and modern luxuries. Photo courtesy Skyview Los Alamos. 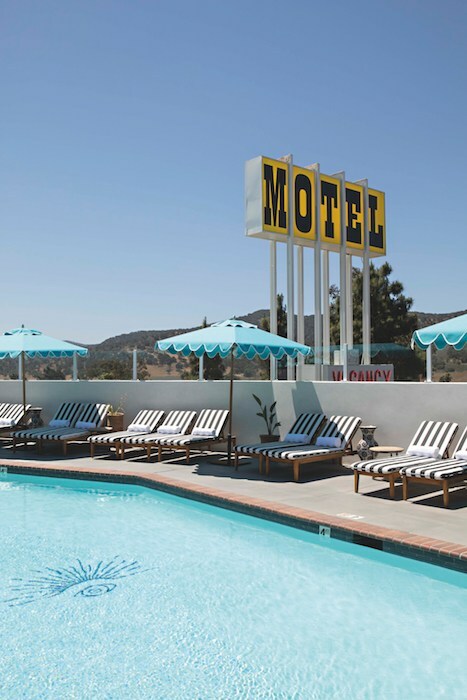 A restored vision of the iconic 1950s era pool and neon sign. Photo courtesy Skyview Los Alamos. 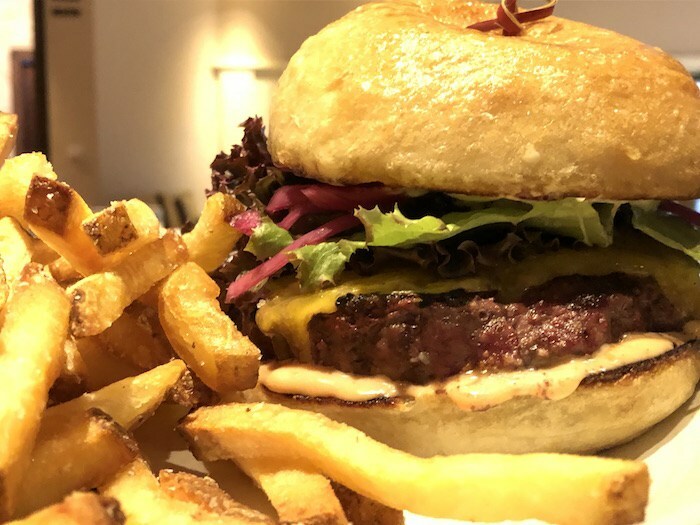 Forest green doors with a midcentury golden starburst beckon guests to pay a visit to Norman—the excellent full-service bar and restaurant named with a wink to Psycho’s Norman Bates. 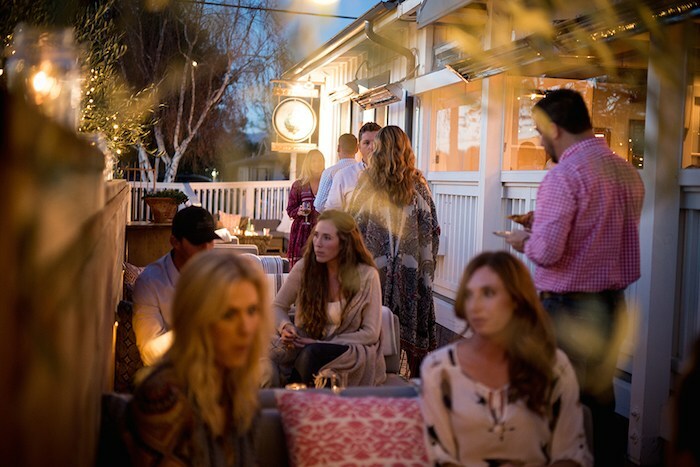 Norman is well worth the drive on its own, and serves local wines, herb-infused cocktails and farm-fresh fare (think shareable plates and lots of salads, fish and house-smoked meats) both poolside and in the retro-chic reinvented dining room. 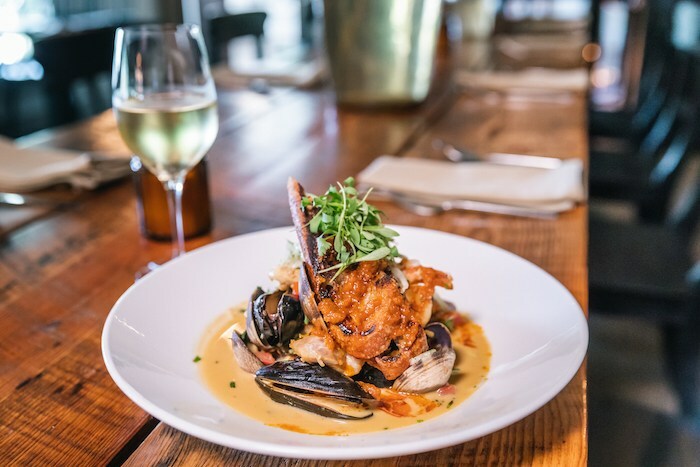 The dog-friendly property is a great spot for a romantic getaway but would also be a fun place to gather with a group of friends for a special occasion or just a weekend hangout.